It's the 1920s and Prohibition is in full swing. Cordelia Grey was forced into marriage after being caught in a compromising position with a young man, but immediately after her nuptials fled Ohio for New York City, accompanied by her closest friend. Letty thinks they're going for her benefit, as she is a talented singer looking for stardom, but only after their arrival she learns that Cordelia is actually searching for father, the notorious bootlegger Darius Grey. The third protagonist in the novel is the flapper Astrid Donal, girlfriend of Darius Grey's son Charlie. The lives of these three young women intersect and diverge, changing them all forever. One of my favorite YA trilogies was Anna Godbersen's The Luxe, and I've been wanting to check out her follow-up series for a while and I can't help but compare the two. As with The Luxe, the first few pages of Bright Young Things foretell of the ending - one of these girls will be famous, one will be married, and one will be dead. In The Luxe it began with a character's funeral and the story worked its way towards that funeral. But here, the promised outcomes apparently are at the end of the series. In that way, I found this story a bit lacking. Sure, there are romance and scandals and danger, but somehow it all seemed a bit less dramatic than I had hoped. I liked Cordelia with her fake sophistication and devil-may-care attitude. Letty seems to be the naive one, Astrid world-weary and suspicious. They were all fairly likeable and distinct enough, though I didn't find them especially well-developed. They're probably similarly developed to the characters in The Luxe, but I think I preferred that series because of the time period and the types of social interactions and scandals. There was a time when I was totally enthralled by the 20s, but I think that era just no longer has the same appeal to me as others do. Although I'm left hanging by the promises at the beginning of the book, I don't think I'll read the later books in this series. I'm sure I'd enjoy them well enough, as I did this one, there are just so many other books I'm looking forward to even more. 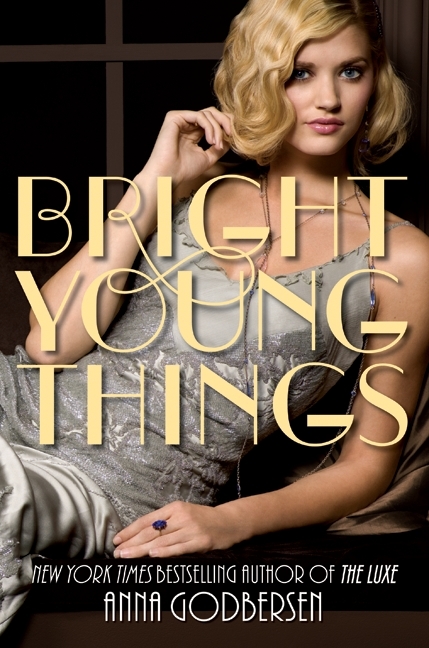 But if you're looking for a young adult book that captures the spirit of the 1920s, look no farther; from the cigarette girls to the lavish parties to the organized crime, Bright Young Things captures the feeling of life in this bygone era.